Last year Lewisham Council in partnership with 5 primary schools across the borough held what we are calling WEEE Week. WEEE stands for Waste Electrical and Electronic Equipment and with the help of WEEE Man (see image below) we visited 5 primary schools in the borough and spoke to the children in their assemblies. 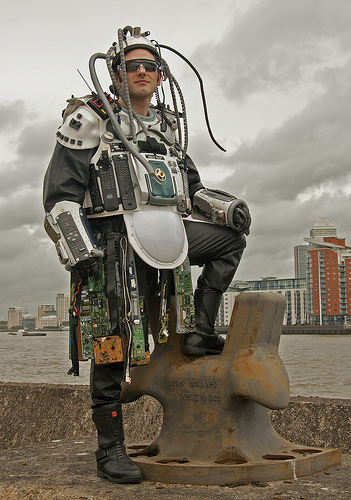 ‘I want your old and redundant electronic waste during WEEE Week’. The assemblies involved a short presentation to the children starting with general recycling which they are now quite familiar with, we then introduce the idea of recycling electronic waste such as small appliances like toasters, kettles, radios, hairdryers, DVD players, old video recorders and other kitchen appliances. After the presentation we show the children the short film we made to introduce WEEE Man http://www.youtube.com/watch?v=Ten5m-K_ySo which helps to give them a flavour of what he looks like and what he represents. WEEE Man helps us champion the WEEE recycling message and is a good way of engaging with the children. Once we’ve shown the kids the short film, we then surprise them by introducing WEEE Man himself who comes out from behind the curtain or side door. Kids are fascinated by the WEEE Man character covered in buttons and other electronic paraphernalia and get quite excited by seeing him. After a quick walk around the assembly hall allowing kids to get a close look at WEEE Man, he then makes a quick exit. We then inform the assembly and teachers alike that we will be back in two weeks time with a collection vehicle to collect all manner of redundant electronic items which we hope parents and children will bring in for WEEE Week when they drop their kids off at school. The kids will also be given a leaflet which they can take home so that their parents are aware of the event. We would also like residents who live local to the schools to use this as an opportunity give us their redundant WEEE waste. Categories: community engagement, Environmental Campaigns, WEEE | Tags: Adamsrill Primary School, Coopers Lane Primary School, John Stainer Community Primary School, Tidemill Academy, WEEE Collections, WEEE collections at schools, WEEE collections at schools 2012, WEEE man, WEEE Man 2012, WEEE Man assemblies in schools, WEEE Man collections, WEEE waste | Permalink.